Nanta symbolically hands over the Mobilepreneur motorcycle to Matius Intai Tabol. Among those on stage are Jackline (left), Belayong (fourth left), Jamit (seventh left), and Douglas (right). KAPIT: Majlis Amanah Rakyat (MARA) has been asked to increase the number of trading premises for bumiputera entrepreneurs here. Deputy Minister of Rural and Regional Development Datuk Alexander Nanta Linggi said at present there are only eight MARA premises for rent here. “I believe that is no longer adequate to cater to the increasing number of entrepreneurs, so I request for MARA to quickly develop and construct a new business premises for more Bumiputera entrepreneurs to acquire business premises in Kapit,” he told a press conference after launching MARA’s ‘Jom Balik Kampung’ programme on Sunday. Nanta said Kapit Division has also been identified as the location for the state’s MARA EduBiz Park – an education and business park. “Meaning to say with this programme, what is expected is that MARA will focus on entrepreneurship as well as promote education facilities and tertiary education for training of the rural population. “I hope this MARA EduBiz Park programme could take off soon,” he said. On the large turnout for the ‘Jom Balik Kampung’ programme, he said it showed the people are interested in seeking information on education and business opportunities. “And today we saw the handing over of seven units of motorcycles under the Mobilepreneurs project that are equipped with a box complete with various tools and equipment. If someone gets a unit of for a beautician, he or she gets the whole set of equipment required for a beautician’s scope of work. If someone is involved in an electrical repair business, then he will get a set of electrical equipment in the box. 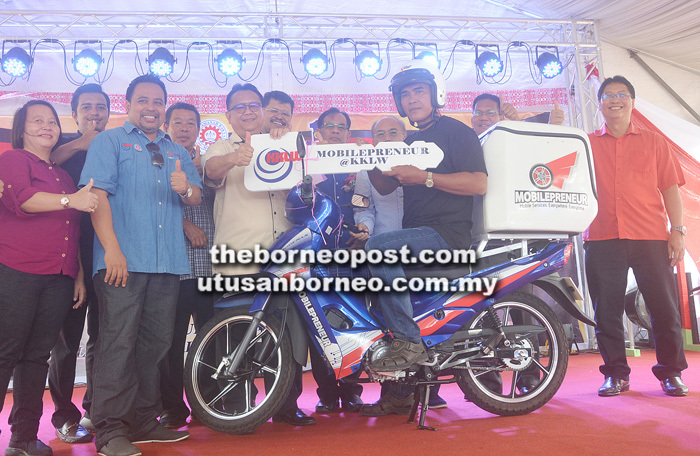 “The whole set of the Mobilepreneurs motorcycles cost RM10,000 each and for the whole of the seven Mobilepreneurs, it costs some RM70,000. This is one of the programmes by MARA and indeed a programme by the Ministry of Rural and Regional Development Malaysia trying to empower the people through entrepreneurship,” he stressed. Nanta also said he has requested for a MARA Professional College to be set up here. “The students need not pay fees. They are sponsored by the government unlike when they go MARA Polytechnic College where they have to pay fees and students have to borrow through PTPTN (National Higher Education Fund Corporation) or are self-funded. But to go to MARA Professional College, I was told that the fees are free, no charge. So that is a big advantage to the students from our area,” he said. Among those present were Bukit Goram assemblyman Jefferson Jamit Unyat, Kapit Resident Joseph Belayong Punan, Bukit Mabong District Officer Douglas Pungga, and Song District Officer Jackline August.